The race was first held in 2006 with a series of build-up races now supporting it and leading up to this annual event. Involving teams of two people, they swim between 26 islands and then run across them. 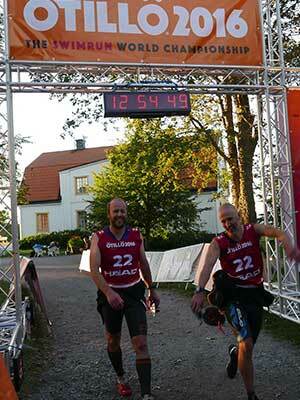 This year a new world record of 7:59.04 was set but some competitors took over 14 hours. It offers an extremely tough challenge to participants and an almost equal challenge to anyone wishing to bring the event to viewers! We are Spocks Family, a communications company that specialises in storytelling for video production. The Spocks Family name is new but the company has been operating for four years. Right from the outset ten years ago we've been wondering how anyone could bring this extremely tough race to a much wider audience. But given that it takes place across an archipelago, in and out of water and over 75 km you can immediately see the immense challenges, connectivity being a main one. While 3G networks are available, a single connection was never going to be enough. Of course the islands of the archipelago are not connected to one another via fibre and given our budget using satellite was out of the question too. So four years ago we did the first actual test. We used simple, cheap solutions to see if it was possible to even get any image out of there. We found that it was possible but that it's, of course, very technology-dependent. 3G coverage is there but as mentioned above, this wasn't ever going to be sufficient. We needed several. Because we are moving on boats, across islands, slipping, sliding in water, out of water we needed a much more reliable as well as flexible solution. After a variety of further tests across other events - including trialling two LiveU units at last year's race - this year we were in a position to deploy three LiveU units with three mobile camera operators. There were a further two fixed position cameras. Spocks Family built a temporary studio and small control room on one of the islands. This had 100Mbit/s fibre connectivity back into mainland infrastructure so getting the overall feed out was no problem. A sports commentator helped to bring the event alive to viewers across the day. LiveU gave us the ability to shoot from a helicopter, car and boats, which we did, and the camera opertars could move freely and not worry about the technology. I controlled the units and monitored their power using the LiveU Central management platform. This was very important in this production. We could monitor the parameters that we needed to using mobile phones to communicate with the camera operators. From the two LiveU servers (two units on one server and the third on a second server), we output HD-SDI to our BlackMagic Atem video mixer. We streamed 720p50 so we had all our equipment set to that, except from the third LiveU field unit that sent 1080i50 from the helicopter. The reason for that was the feed was also being used for a VOD clip that was going to be separately produced after the race and the native resolution required was 1080. We took the 1080i50 feed that passed through the server into a tvONE scaler in the control room that transcoded it to a 720p50 before it went into the Atem mixer. Each video team had a wireless handheld mic: sound was embedded in SDI and that was then de-embedded from the SDI feeds in the control room into a sound mixer and then back to the program output. In the Atem mixer the sound, graphics, race results, three video teams, a wired studio camera and a wired finish line camera were mixed and put together and the 720p50 output was sent via HD-SDI to an encoder to create the program feed. It was then sent to our reflection server in Prague that could mirror the stream to YouTube. We set a finish line camera whose stream was separately encoded since the main broadcast ends before everyone has reached the finish line. This meant the audience could still watch the finish line until the very end. It's a small service we can provide for them and it meant a lot for the family and friends of the racers. In total, Spocks Family streamed for nearly 12 hours. Using LiveU allowed our camera operators to concentrate on what they were doing - a very difficult task - without having to worry at all about the technology. Without this we couldn't have created this production. Using LiveU solved many problems and provided us with the mobility, robustness and flexibility we needed. We had no connectivity issues during the race - not a single black frame.